Although rainwater can be collected from any catchment surface, rooftops of homes generally yield the best quality of water with the least need for treatment. Not all rainwater that comes down on the roof can be collected though as some water is inevitably lost to evaporation, wind, overflowing gutters and leaky pipes. Calculate how much rain you will be able to collect from the roof of your house or apartment building. Using the Internet locate monthly and yearly rainfall for your region. Use the equation below to calculate the amount of water in gallons your rooftop can collect. Calculate the area of your rooftop by multiplying the width x the length. Once you have calculated how much rain falls on your roof annually, you can call the utility company and find out how many gallons of water you pay for every year. If you collected rainwater and used it for gray water purposes, what percentage of your annual water bill could you potentially save? Do you think it is a good idea to collect this rainwater? Activity 2 – SInk, Float or Swim? 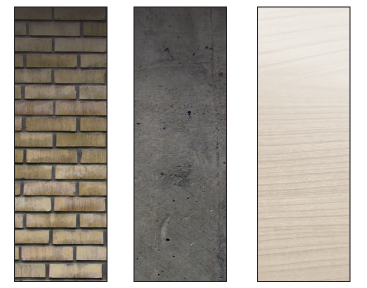 Rain falls on a variety of natural and built surfaces. What surfaces make rain fall the fastest? Select several flat surfaces of different materials (all of the same length) such as plywood, cardboard, metal, plastic, a friend’s back, or outdoor carpet. Set up the materials side by side on an incline of 30 degrees. Get a stopwatch and a pitcher of water and a measuring cup. Place your bets! Which surface do you think will be the fastest? Make a chart of your findings. Rainwater that runs over a surface collects dirt and delivers it directly to the water source. Rainwater that is absorbed, enters a filtering system that helps remove impurities before the water enters the source. Rainwater management requires storing or filtering water on site so that it re-enters the water cycle cleanly. You can also study pervious collectors vs. impervious surfaces by using a sponge and a metal muffin tin. Watch the muffin tin video. Pour water on a metal muffin tin; watch how the water runs off the top of the tin and collects in the cup area. 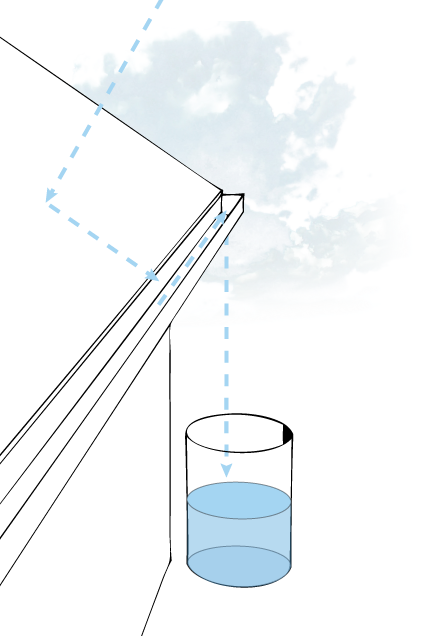 This is how a cistern or water container works. Next try a sponge. Running water over a sponge you will notice that the sponge is getting heavier and heavier with water as it fills. This is very much how a rain garden works. It is a lower lying area that collects and absorbs water and filters it with plants instead of letting it run directly into the street, the drain and the nearest river. Take pictures of your rain collection experiment and put them in your journal. 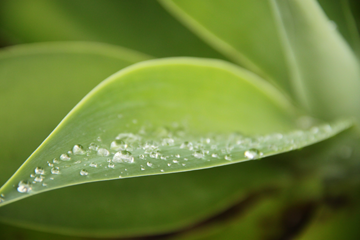 Plants collect rain in the curvature of their leaves. How can our buildings collect rain? We can collect rain on our roofs. Roof drains, gutters and downspouts collect rainwater and can be connected into above ground barrels or underground cisterns. It is important to screen rainwater collection from branches and leaves that may clog the openings. It is also important to cover the collected water so as not to become a breeding ground for insects like mosquitoes. Research types of rainwater collectors that are available. Compare storage capacity and cost of at least three collectors. Check out these leaf shaped water collector! You can even make your own and connect it to your downspouts or to a rainwater barrel! 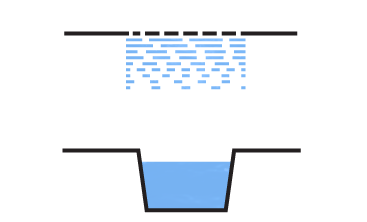 Diagram a rain water system that collects rain from the roof of a building, from connected downspouts, and from three other exterior sources. Show how these sources can be used for irrigation and toilet flushing. Think of collecting rain at your house and at your school. 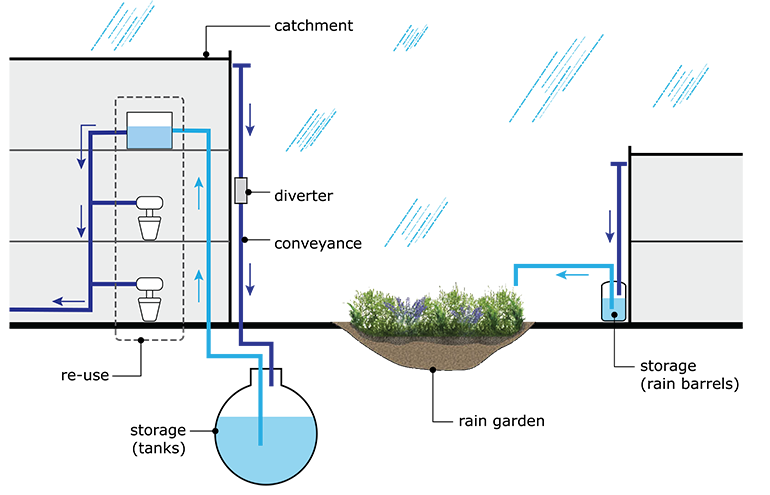 Diagram the parts of a rainwater harvesting system. Present it to your class and to your community to get everyone thinking about harvesting rainwater. What is rainwater that is collected called? 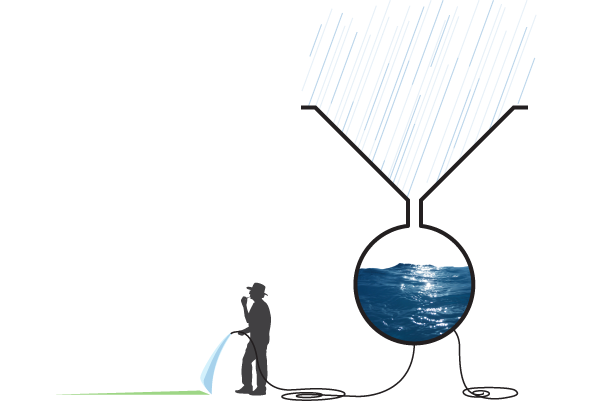 Harvested Rainwater can be used directly for drinking. Wastewater from sinks and showers can be reused if processed for non potable watering, irrigation and toilet flushing. Harvesting rainwater helps offset use of processed water and saves energy.